Many people swear by the benefits of incorporating a trampoline into their workouts, but purchasing a traditional trampoline is not always a feasible solution for people looking to get fit. If you don’t have a yard large enough to accommodate a trampoline, or you aren’t allowed to have one per your homeowner’s association, you may feel like your hands are tied. Larger trampolines are often expensive, and may not be the best solution for fitness buffs on a budget. 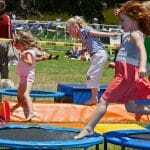 That’s where best mini trampolines for fitness come into play. These are far more affordable and easier to assemble than a large trampoline. They’re also great for people who are short on space. If you live in the city or you have a garage gym, a fitness trampoline is the answer. You’ll be able to perform most of the same workouts you would on a larger trampoline without worrying about having enough space or taking a large bite out of your wallet. Trampolines can help workout enthusiasts build stamina, burn calories, and tone several major muscle groups. 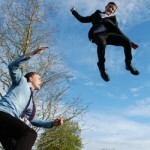 It all depends on how you intend on using your trampoline. The truth is, there’s no shortage of benefits, and everyone would be able to make good use of a fitness trampoline. While you’re jumping, you’re essentially targeting every muscle group below your shoulders. Your core is engaged, as are your legs and glutes. While a trampoline on its own may not necessarily help you develop strength, you’ll certainly be able to tone and define these areas. Legs in particular can be hard to tone with other exercises. With a trampoline, toning actually doesn’t require much effort. Consistently jumping on a trampoline is also heart smart. This medium intensity aerobic activity can strengthen the heart and the lungs. Over time, this can lead to an increased lung capacity, more cardiovascular stamina, and improved blood pressure. Like any cardio based workout activity, it also burns quite a few calories. You can feel free to indulge in a burger or a slice of pizza once in a while by counteracting it with some extra time spent bouncing. If you’re looking to trim down your figure, the combination of healthy eating and cardiovascular exercise is an excellent way to shed the pounds. Trampolining also has its distinct advantages over alternative forms of exercise. For example, bouncing on a fitness trampoline is low-impact. Jogging or running on hard surfaces tends to cause small amounts of damage to the joints. Over time, this damage can accumulate and cause larger issues. Since a trampoline rebounds, the impact is significantly reduced. 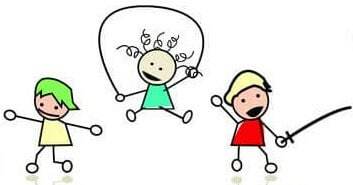 As a side note, studies have shown that bouncing can also strengthen the lymph nodes, which may lead to a better functioning immune system. With a fitness trampoline, the possibilities are endless. These are just a few of the best workouts you can perform with your mini trampoline. This one may sound more complicated than it actually is, but the trampoline works in your favor. Having the rebound of the trampoline makes this workout a lot easier without compromising how effective it is. Get on the floor in the normal plank position, but rather than resting your forearms on the ground, rest them in the center of the trampoline. Lift yourself up with your hands, executing a plank. From the plank, go right into a pushup in one fluid motion, and return back to the plank position. As you do this, be sure that you’re distributing the power between your arms and your abs. This should make for a great core workout as well as an arm workout, and neglecting your abs would actually be considered improper form. Try to start for 15 seconds at a time between short rest breaks, and as you become used to the work out, extend to as long as 30 seconds of constant activity. Make sure you take a few seconds of rest between sets, and cap it off at 3 reps. There aren’t many frills to bouncing on the trampoline. Mostly, it’s assuming proper form that makes all the difference. By bouncing properly, you’re targeting core muscle groups to be toned, burning tons of calories, and avoiding risk of injury due to improper use. Safety is key. Stand in the center of your fitness trampoline with your feet approximately 6 inches apart. Shoulder width is too wide, and my affect your balance. With your arms bent, rest your elbows by your sides. Slightly bend your knee as you bounce, keeping your core engaged. Bounce lightly – never attempt to go higher than 6 inches off of the jump pad. Start with 30 bounces, and work your way up to a higher number in future workouts as you become used to the bounce. Squatting on an immovable surface is hard enough, but squatting on a trampoline ups the ante. Since a trampoline isn’t level and provides rebound, an effective trampoline squat really puts the core muscles to work. Stand in the center of your trampoline with your feet together, rather than at normal squatting distance. Rest your arms down by your sides. As you jump, spread your feet out a little past shoulder width. Land with a bend in your knees, your thighs parallel to the ground, and your arms out in front of you for balance. The way you land should mimic a normal squat position. With a light bounce, rebound back to starting position. 20 reps is perfect for a beginner. This workout combines cardio with toning, making it the best of both worlds. If you’re familiar with regular prances, the concept is very similar. It still involves leg lifts, but the intensity is much higher due to the trampoline. 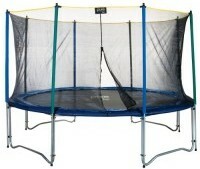 With your feet about 6 inches apart, position yourself in the center of yoru fitness trampoline. Place your hands on your hips, and slightly bend your knees. 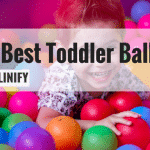 Use the balls of your feet to bounce, and alternate raising your left and right knees to be level with your hips. Go for 30 lifts per side, making a total of 60 lifts. It may seem difficult to execute a lateral reaching exercise on a trampoline, but many fitness trampolines come with lateral reach attachments for this exact purpose. 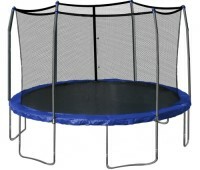 Start by sitting down in the center of the trampoline, and rapidly bounce up into a standing position. As you stand up, reach one arm across your body. Drop back down to sitting, and alternate arms. If you want to boost intensity even further, contract your abs as you work through the moves. There’s a great fitness trampoline for everybody. 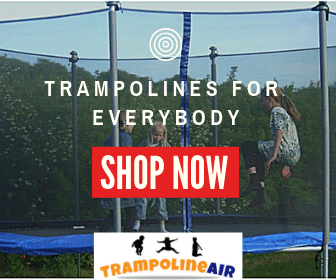 Mini trampolines come in a variety of different sizes, with a variety of different features, and at a variety of different price points. A few considerations can help you determine which one will work best in your home gym. 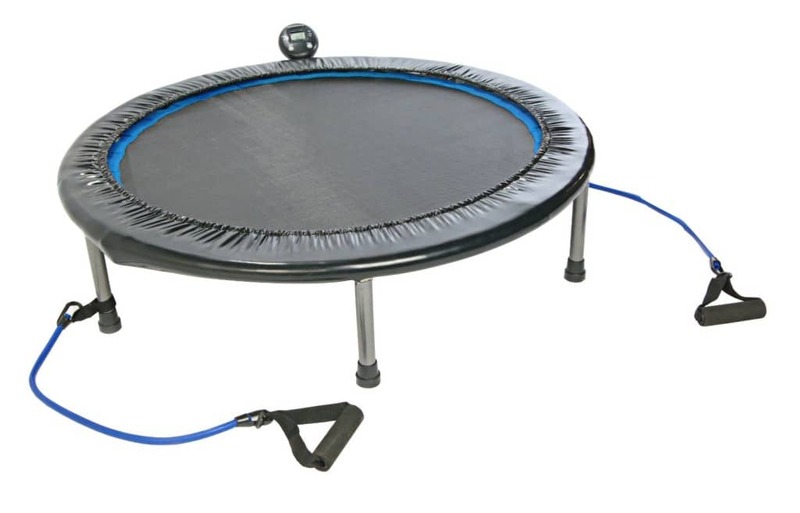 JumpSport makes the most durable and best mini trampoline on the market. This trampoline has a 39 inch diameter and sufficient safety padding around the mat. It’s been coated twice, so you won’t have to worry about the finish shipping away. Its 30 EnduroLast cords make it rated for up to 1 million jumping cycles. 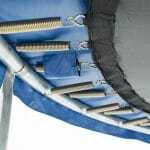 You’ll never have to worry about this trampoline falling apart on you – it’s all but bulletproof. 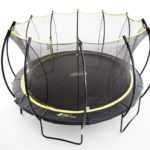 The unique oval shape of this mini trampoline makes workouts easier for people who are beginners, or who have a difficult time finding their center of gravity. The black padding is surrounded by a blue border, making it easier to see where the jump pad ends and the spring padding begins. 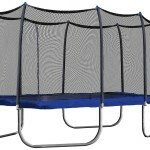 It comes with a bar that can be incorporated into workouts, or held onto to help the jumper maintain his or her balance. You’ll also get lat pull attachments for easier workouts. One cool bonus about this trampoline is that it comes with a monitor that will allow you to time your workouts, see how many times you’ve jumped, and track the calories you’ve burned. This trampoline boasts an impressive size for a mini model. It can also be folded and comes with a carrying bag, making it a great option for people who will need to put their trampolines away to save space. The frame is made of heavy-duty steel and the pad is suspended by 32 springs to increase durability even further. This model comes with an attachable stability bar that can be customized to three different heights, making it easily useable by everyone. This is the best value for a budget trampoline. 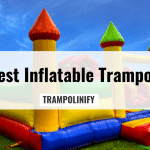 If you aren’t looking to spend a ton and you don’t need a trampoline with many complicated features, you’ll find that this smaller model by Stamina is the answer you’ve been searching for. It’s compact, portable, and it comes with two resistance bands and a simple workout monitor. It’s great for easy workouts, and a perfect alternative for people who don’t intend on using their fitness trampoline on a regular basis. 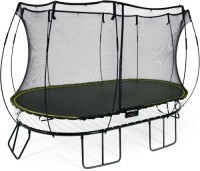 Pure Fun’s mini trampoline is an excellent compromise between quality and price. It’s less expensive than premium models, but more functional than budget models. This model has 36 springs and is balanced on 5 legs, making it stable and durable. The blue spring pad provides maximum visibility, making sure you can stay centered on the jump pad. It comes with a hand rail that adjusts to two separate positions so it can be incorporated into different workouts. Since mini trampolines are so inexpensive, effective, and easy to store, you can’t afford to skip one for your home gym.